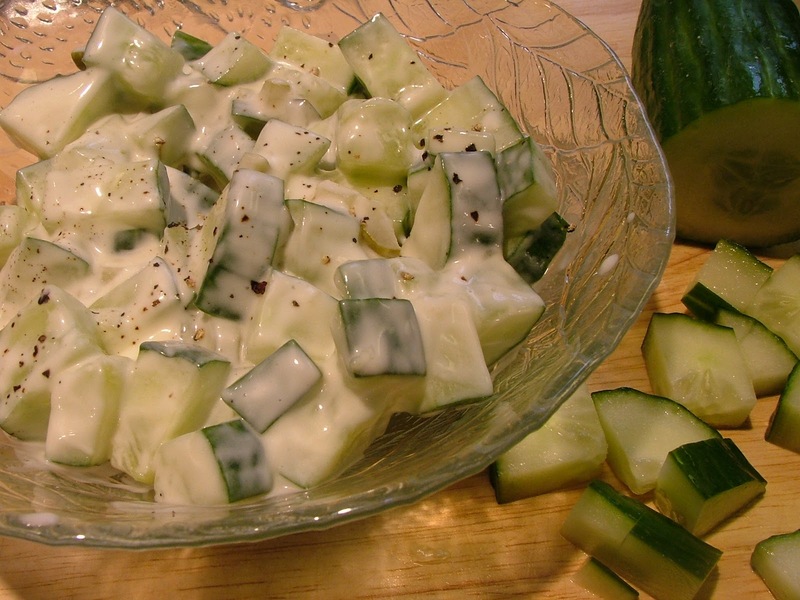 Creamy cucumber salad makes me think of summer barbecues. Since those types of feasts are still many months away, I figured this summer side dish could also pose as a healthy winter snack. 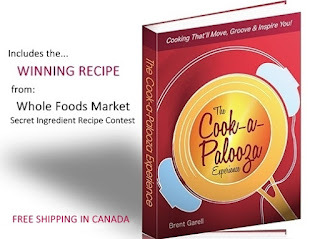 Hey, it's easy to make and much more exciting than munching on plain English cucumber slices. A common ingredient in cucumber salad is fresh or dried dill and that could pose a problem if you're cooking at college, university or just starting your collection of herbs and spices. One way to get around this herb obstacle is to use chopped pickles and a couple teaspoons of pickle juice from the jar. 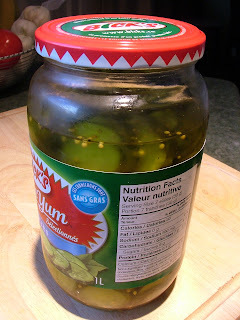 I read that cyclists are drinking pickle juice to help them recover faster from long rides? Crazy bastards. Although...I shouldn't say that because I might start drinking the stuff too if this triathlon training I'm doing really starts to hurt. Anyway, for this recipe the pickle juice is used to add a touch of sourness. The chopped pickle provides the flavor of dill and also boosts the CrUnCH factor. 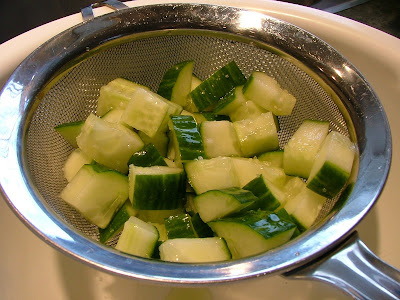 You'll notice the first step in the recipe is to salt the cucumber and let it sit for 30 minutes in a strainer. The purpose of this is to help prevent the salad from getting watery when you store it in the refrigerator. However, if you're planning to eat it right away (like I did), salt the cucumber for flavor and don't sweat letting it sit for the entire 30 minutes. Using fresh or even dried dill would definitely make this salad taste even better. If that's not an option, try this dill pickle and pickle juice substitution. The flavor of dill is more subtle but it works. I certainly didn't mind the substitution as I devoured these creamy cucumbers in one sitting. Place cucumber in a colander or strainer and sprinkle with salt. 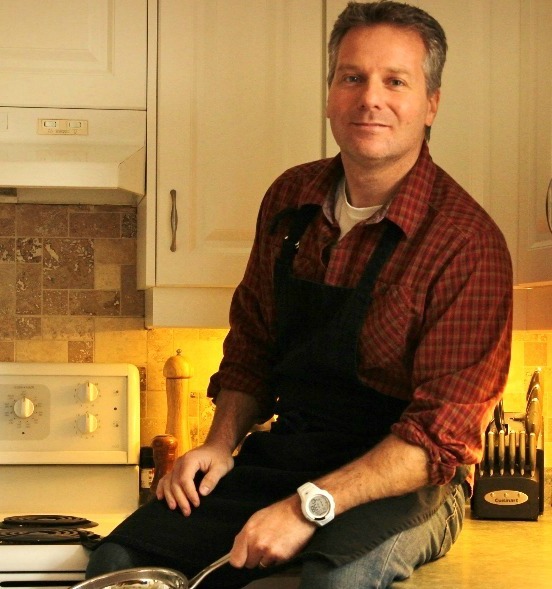 Place over a bowl and let stand to drain for 30 minutes. Meanwhile, to make dressing, in a medium bowl combine mayonnaise, sour cream, pickle, pickle juice and sugar. Mix well. 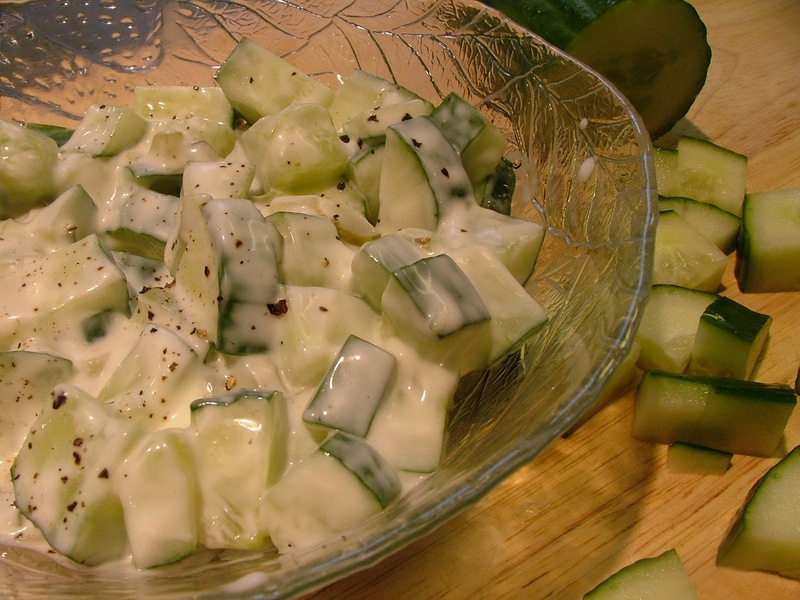 In a serving bowl, toss cucumber with dressing to coat. Season with black pepper.